Café Escadrille is pleased to welcome Miguel Escobar as the restaurant’s new wine director. In his new role, Miguel's responsibilities will include ensuring the continued excellence of our award winning Wine Program at Café Escadrille. Miguel, whose family traveled extensively when he was growing up, says his passion for food and wine started at an early age as he experienced the delicacies of many countries and cultures. He also credits his father’s cooking and his family’s weekly dining out excursions as key factors that cemented for him the importance of food. These experiences taught him that food and – of course – wine play a key role during many of the important occasions in one’s life. 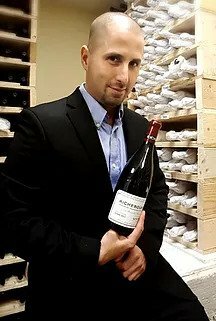 During graduate school, he developed a passion for cooking and for wine – a passion that began on a tight budget buying bargain bin bottles, and eventually grew to include higher priced imported selections. While attending Boston University, he trained alongside culinary legends Jacques Pépin and Alain Sailhac. He also studied under Wine Masters Sandy Block and Bill Nesto, and completed his Level Three Certification in Wine Studies. Miguel’s favorite wines include Rioja, Cabernet Franc, and Pinot Noir, but he's also a fan of lesser-known grapes from around the world. When he’s not holding a wine bottle or a set of tongs, he can be found riding his motorcycle, taking photographs, keeping tabs on the world financial markets, and watching his favorite programs on The History Channel. Miguel holds a bachelor’s degree in Business Management from Northeastern University, a master’s degree in Communications from Simmons College, and a culinary degree from Boston University’s Elizabeth Bishop School. He also earned an Advanced Sommelier Certification from London’s Wine & Spirit Education Trust. For over a decade, during his career in hospitality in the greater Boston area, he has held titles that include General Manager, Sommelier, and Beverage Director.